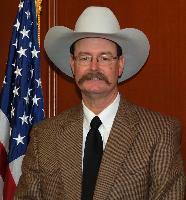 Dave Anderson began his term as District 2 Canadian County Commissioner on January 1, 2009. He is a member of the Republican Party. Native of Mustang, Oklahoma, Dave was born in Mustang in 1959 and graduated from Mustang High School in 1977. He and his wife Debby have been married since 1980. Their son Mark is married to wife Christin, and they have three children: HadLee, Tripp, and Tristin. Their daughter Charlotte is married to husband Jeff Teel, and they have a daughter, Lilly. Before becoming commissioner, Dave was a utility contractor specializing in residential water and sewer main installations. He also owned and operated Cedar Springs Arena in Mustang. Dave likes to spend time outdoors playing golf, hunting, and team roping. He also enjoys watching his grandkids. Dave is a believer in the Lord Jesus Christ and attends the First Baptist Church in Mustang where he teaches an adult Sunday School class and serves as a Deacon.